“How do those Parker Brothers sleep at night?”—Chief Wiggum, ibid. For a deep dive into industrial and pop culture apocrypha, the true importance of Mary Pilon’s investigation into the origins of the most culturally significant board game of the modern era—and one could certainly make the case that Monopoly has chess in check—is fittingly buried deep. In her source notes, Pilon flatly relays the true reason for the preceding 260 pages; The Monopolists is not simply an attempt at delivering, at long last, proper due to the enterprising players who gave rise to one of the most powerful American icons. It is also to engender “the conversation about the ownership of ideas, the evolution of innovation in this country,” which, if one allows her to do just that, leaves one feeling as distraught as Springfield’s suilline top cop. Jobless, hopeless Charles B. Darrow creates a diversion for his and his family’s bleak, Depression-mired existence, has it picked up by Parker Brothers, both bathe in cash as the nation around them turns to dust—and that Alger-esque origin story whispers to something deep inside of us. Monopoly—on our shelves, on our phones, on our french fries—is far from a simple game. Those color coded properties and prismatic notes, the top hat and race car and thimble and scottie dog, are interactive shorthand for the uniquely American pursuit of success, one unencumbered by class—after all, cannot the threadbare shoe be the last player left? To secure its place in the national religion, Monopoly had to undergo a brutal rise which was a perfect reflection of its gameplay; dressed up by Darrow—who, it should be noted, did finally monetize the damn thing—Monopoly would have to be protected. Parker Brothers swiftly purchased the game’s competition and variants, smothering all rivals in cash or court and absorbing all history pre-Darrow, the dangerous history, laying singular claim not only to the game but to the gameplay itself. And were it not for an anti-monopolist San Francisco State economics professor, the myth would have most likely remained history. Ralph Anspach, sick of the Me-Generation solipsism of the 1970s, hit upon the idea of creating a monopoly-deriding game whilst playing the original one night with his family (that an econ professor, even one as Anspach, would own Monopoly is a given). He designed a game wherein trust-busting was the goal, dubbed Anti-Monopoly, and began to gain traction in the historically left-leaning Bay Area, aided by the terrifying economic milieu. 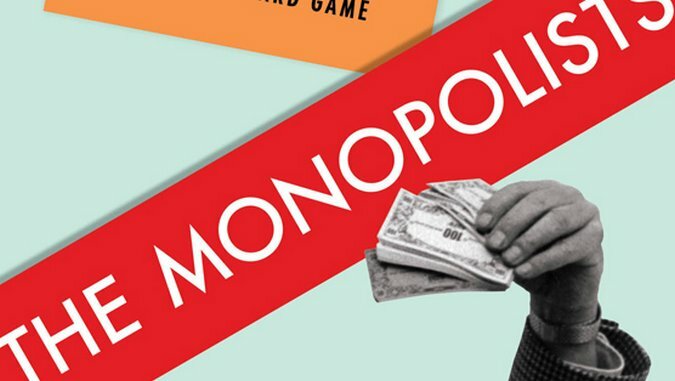 The game came to the attention of Parker Brothers, who ordered Anspach to cease and desist his usage of the word “monopoly;” the lawyers helpfully offered, via an article, the substitute titles Anti-Trust and Trust-Busting. Anspach believed that the commonality of the word “monopoly,” well ensconced in the minds and vocabularies of the public long before its eponymous board game, was critical to the game’s easy and effective communication with consumers and that he had the same right. Winning a court case would require Anspach to prove, among other things, that his title did not cause confusion between his product and Parker’s, and his legal strategy, in a delicious twist, involved looking to nail the Cardboard Empire (Pilon’s coinage, gratefully borrowed here) for violating antitrust laws, in essence having Monopoly declared a monopoly. Had these been Anspach’s only recourses of action, it is likely that he would have lost. Darrow would still be widely considered the inventor of the game, and Pilon would not have a book to write. Luckily, industriousness requires resources, and the professor’s son Mark—reading a book they had purchased whilst making Anti-Monopoly, Marvin Kaye’s A Toy is Born—stumbled across an entry about a precursor to Monopoly: The Landlord’s Game, patented by one Lizzie J. Magie decades before Darrow’s depression era-patent. It was the key to ending Parker Brothers’ reign. While the legal tilt between Anspach and the conglomerate is riveting, it is in Pilon’s tracing of the game’s history that drives The Monopolists. Less a history than an iconography, Pilon lays before us the byzantine evolution of a meme, replete with vestigial structures—the misspelled Marvin Gardens, for example, which Darrow lifted directly from an earlier mistake, the Atlantic City apartment complex being spelled M-a-r-v-e-n—and the variations of its sundry organs and actions. Magie created The Landlord’s Game as a way of reaffirming the single tax theories of economist Henry George. Her game, while similar to modern Monopoly, could also be played with an anti-monopolistic rule set, which more closely hewed to her message; evolution can be cruel in its disfigurement—how twisted the meme has become since birth! Magie and her fellow Georgists reached the zenith of their relatively benign political power around the turn of the century, and their single tax communities of the early 1900s would prove critical incubators for Magie’s progressive, highly politicized game. Arden, Del., placed in proximity of the East Coast elite, served as an epicenter from which The Landlord’s Game spread. Among the game’s earliest—and most important—champions were Upton Sinclair and Scott Nearing, a professor at Wharton. The pair were crucial in the dissemination of the “monopoly game”—Nearing’s later-crucial coining—among the various Brahmins and academics of the East, not the least of which including the regular stream of sharp minds in Nearing’s UPenn class rooms. According to Pilon, Nearing also most likely taught the monopolistic rule set—one imagines, perhaps, for the pleasure of conquest it provides—thereby changing the very core of its play for the game’s foreseeable life. From Arden, the freshly christened monopoly spread to various college dorm rooms and salons, never in print codified and proudly unregulated. Key among these was Atlantic City, where the powerful Quakers adopted the game, adding the place names we still use today and producing, on oil cloth, boards that would be comfortably familiar to the modern player. Despite being Magie’s creation and Darrow’s claim, the Atlantic City Quakers could be considered the true parents and stewards of Monopoly; is their nomenclature which we still use, and it is from them that Darrow, in a rather obliquitous manner, learned the game. Anspach would dedicate himself, post-case, to making sure that the Monopoly progenitors, from Magie and the Georgists to Ivy League students, from other aspiring Cardboard Emperors to Atlantic City’s regency, would receive their recognition. The Monopolists may be—should be—the misericordia with which the final deathblow is dealt the Darrow myth, although romantic Exceptionalism dies hard on these shores and Pilon’s thrust, while swift, is not particularly sharp. The book is superlative journalism, yet it reads as just that, and while one sympathizes with the monumental task of applying electric flesh to a skeleton so old, a sentence like “Clank, clank, clank went the keys of the agent’s typewriter” is simply too viciously brute to not be castigated here. Such moments are few, and seem indicative of the desperate battering ram sentence all writer’s must avail themselves of once in a while, with Pilon’s just being a bit blunter, even as its cause is more righteous. In deconstructing the Monopoly myth, Pilon puts in its place a Homeric epic, wherein we can foster a more accurate relationship with our domestic shrine to business. Having once written for the Wall Street Journal, Pilon undoubtedly understands that our connection with the impulses of American culture is a complicated one; case in point, the nagging feeling that Parker Brothers, atrophying in the Great Depression, acted in a manner approaching base instinct for any titan. B. David Zarley is a freelance journalist, essayist, and book/music/art critic currently based in Chicago. A former book critic for The Myrtle Beach Sun News, his work can be seen in VICE, Sports on Earth, The Classical and Newcity, among numerous other publications. You can find him on Twitter or at his website.